A few months ago I mentioned that the tales of King Arthur and his court—the Arthuriad—make up one of the most adaptable mythologies of all. We can take a look at some of these variations (Part I), and follow up by considering what makes these legends so endlessly fascinating and malleable (Part II). Wikipedia hosts two separate pages that enumerate versions of the Arthuriad: List of works based on Arthurian legends and List of media based on Arthurian legend. Tendrils of the Arthurian tree reach into such distant nooks as “Indiana Jones and the Last Crusade,” which relies centrally on the Grail legend. The Arthuriad grew from many sources. A number of originally unconnected legends were gradually brought together under one roof—one reason there’s such a plenitude of material in the legendry. A few brief mentions of Arthur in medieval histories gave rise to tales and poems in England, in France, and in Wales. Writers like Geoffrey of Monmouth and Thomas Malory assembled these various tales into more or less connected narratives. The resulting mythology is the central part of the “Matter of Britain”—one of the three subjects that the medievals considered of paramount importance for literary development, along with the “Matter of France” (tales of Charlemagne and his court) and the “Matter of Rome” (the ancient myths that focused on the Trojan War and its ramifications). It would take a scholarly treatise to deal with this history, not a blog post, even if I were qualified to write such an account. Here I just want to note a few of the more interesting variations I’ve come across. I like to divide treatments of the Arthuriad into “high road” and “low road” versions. On the high road we find the kind of setting that we usually think of in connection with the mythical Round Table: knights in plate mail, ladies in silks and satins, magic from Merlin to the Green Knight round every corner. This is Malory’s version, which reflected the customs and cultural level of Malory’s own time, rather than the historical setting in which Arthur was supposed to be placed. The low road takes us to adaptations that hew more closely to actual history. Here the writer seeks to make an Arthurian chronicle compatible with what we know of the real fifth or sixth century. Magic and mysticism are minimized, and naturalistic explanations may be given for paranatural features of the original legends, such as the Sword in the Stone. Contemporary retellings generally prefer the low road, grittier and less idealized than the plate-mail versions. The high-fantasy Arthur is exemplified by Malory’s Le Morte d’Arthur (The Death of Arthur), which holds a central place: to quote Charles Williams in The Figure of Arthur (p. 246), “it is Malory’s book which is for English readers the record book of Arthur and of the Grail.” Traditional versions, particularly in the movies, tend to track Malory—at least in part, because no single novel or movie can possibly touch on the vast trove of material in Le Morte d’Arthur. The trouble is that Malory is hard to read. The language is archaic, and the mode of storytelling is far removed from contemporary styles. Malory spends inordinate amounts of time on things like catalogues of knights at a tournament, and less than we would expect on characters’ thoughts and motivations. We are thus inclined to search for a version more accessible to the modern reader. Personally, I’m not pleased with either of those dramatic offspring. The treatment of the main characters in “Camelot”is terrible (at least in the movie version), and “The Sword in the Stone” is Disneyfied in the bad sense, written down and trivialized. 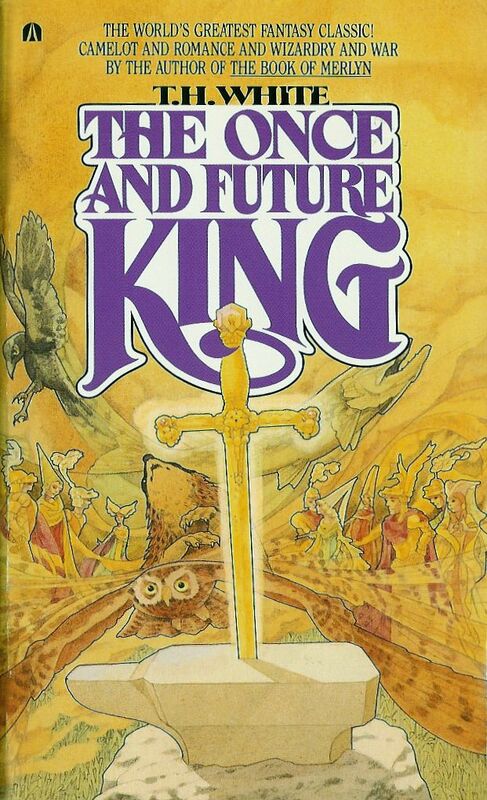 John Steinbeck began a treatment that can be found under the title The Acts of King Arthur and His Noble Knights. This might have been a candidate for a canonical modern version, if Steinbeck had ever completed it. The book starts as a quasi-translation of Malory, but starts to develop more independently as it goes along. It didn’t get very far, however, before Steinbeck abandoned it—perhaps because he hadn’t decided whether to keep diverging from his source material. 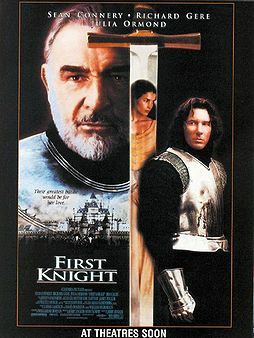 On the screen, the 1995 film “First Knight,” with Sean Connery and Richard Gere, may be the best modern example of the high-road approach. The main plot of the story is the tragic love story of Arthur, Guinevere, and Lancelot, though in this iteration Lancelot and Guinevere are left alive and apparently free to marry at Arthur’s death—an example of how those who favor romantic happy endings try to sort out the central romantic triangle. Along with some gritty realism, the film does give us an idealized Camelot, shown more straightforwardly than in most modern adaptations. 1981’s “Excalibur” may have started the trend toward more realistic versions in the movies. Based purely on Malory, according to Wikipedia, the movie includes more explicit violence and more primitive settings than in “First Knight” or “Camelot.” Nonetheless, “Excalibur” does incorporate the Grail theme and the mystical notion of the Fisher-King. 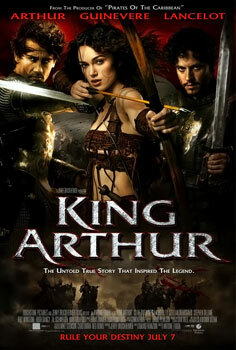 A more recent example of the low-road movie is “King Arthur.” Here Arthur is a Roman warleader, upholding the last of the fading Roman civilization in Britain, and Guinevere is a Celtic warrior maiden. In this version, Lancelot dies (without real romantic entanglement) and the movie ends with Arthur and Guinevere’s marriage, stopping short of all the difficult tragic material later in the legend. On the book side, the low road may be represented by Mary Stewart’s quintet that begins with The Crystal Cave. 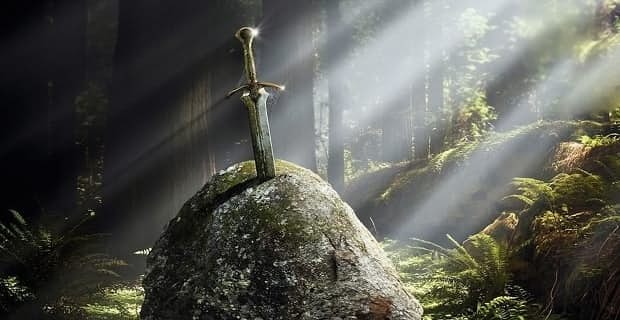 In one classic example of a non-magical explanation for a traditional scene, Merlin leaves the sword Caliburn for many years in a cave where dripping water gradually deposits a limestone crust over the blade, from which Arthur breaks it free when he recovers the sword—a neat nod to Malory’s magical sword in the stone. It really gets interesting when authors start tugging and pulling at the legend to develop stories that depart more strikingly from the Malory-based legends. 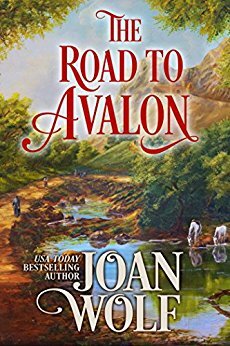 One of my favorites is The Road to Avalon (1988), by Joan Wolf. This novel takes a low-road approach, with almost nothing in the way of magic or the paranormal. Here again Arthur is primarily a warleader, Comes Brittaniarum. But he is also fiercely dedicated to preserving against barbarism the civilized culture represented by Rome—an aspect we shall have occasion to revisit. Wolf’s character treatment is what’s most interesting. Here Morgan (usually “Morgan le Fay,” portrayed as a dangerous fairy or sorceress) is the female lead and Arthur’s real true love. Gwenhwyfar is sympathetic, if a little shallow, but she never did have much more than a dynastic connection with Arthur, which makes her unfaithfulness with Bedwyr (this version’s Lancelot) more palatable. In other words, the traditional romantic triangle is skewed—to the good, in this case. In Wolf, Mordred, usually the arch-enemy, is a likable boy; Agravaine is the real villain. There’s a Round Table, for the right reason (to make those who sit at it equals, with no “head of the table” precedence). But there are no knights in the plate-mail sense. Religion hardly plays a role, much less the Grail. But the story is very satisfying, and is followed by two sequels, one set in the generation after Arthur and the other taking up the life of Alfred. There are lots more. Marion Zimmer Bradley’s The Mists of Avalon is a feminist version, again with Morgaine as the heroine. Stephen Lawhead’s five-book Pendragon Cycle starts out in Atlantis—from which we can see how eccentric the plotline has become. The Last Legion (both book and movie) again stress the Roman connection, with the last emperor of Rome traveling to Britain to found the dynasty that will produce Arthur. And of course, in the slapstick comedy category, we have Monty Python and the Holy Grail. I’ve seen surprisingly few stories that build on the tradition of Arthur as the “once and future king”—rex quondam rexque futurus. Arthur is supposed to return; but the tales generally leave him ambiguously ensconced in Avalon. In C.S. Lewis’s That Hideous Strength, we do see a revived Merlin in the present day, and we’re told in Perelandra that Arthur waits on Venus to come back to Earth for a final battle—but we don’t see that in the stories. Tim Powers’ oddball The Drawing of the Dark has an eccentric return for Arthur—focusing mostly on beer. Guy Gavriel Kay’s Fionavar Tapestry promotes a resolution of the Arthurian tragedy that takes place in another world, but draws in characters from our contemporary world. I remember fondly, for some reason, a 1970 children’s book by Tom McGowen, Sir MacHinery, in which an experimental robot is perceived by a group of present-day Scottish Brownies as an armored knight—the crate is stenciled MACHINERY—where the inventor happens to bear the name Simon Arthur Smith. But I haven’t run across as many stories about the return of Arthur as one might expect. Some interesting potential there . . . This spate of examples illustrates the wide range of variations to which the Arthurian legends are susceptible. What makes them so adaptable, and so attractive to storytellers of all kinds? We’ll take those questions up in the next episode.